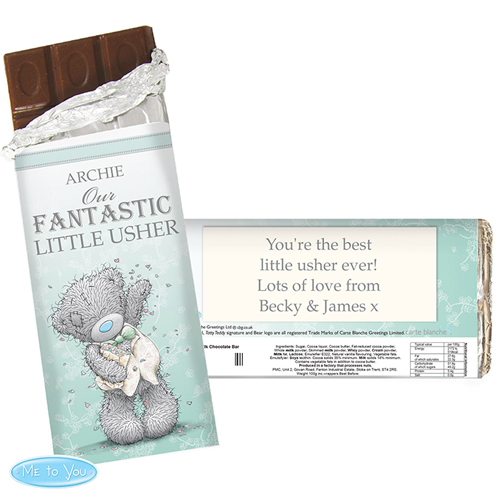 Personalise the front of this Personalised Me to You Male Wedding Chocolate Bar with a name of up to 12 characters long. You can then personalise the last line with a name of up to 15 characters long (Usher, Best Man, Page Boy etc.). On the reverse you can personalise with a message up to four lines of 20 characters per line. 'Our Fantastic' is fixed text on this item. The personalisation entered on the front of this chocolate bar will appear in uppercase. All other personalisation on the reverse will appear as entered and is case sensitive.